After graduating with a physics degree from the University of Chicago, Claire spent her time exploring several different career options, from market research and consulting to professional baking and pastry. 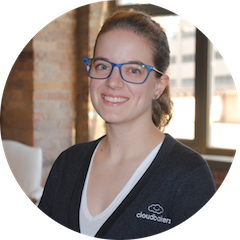 Ultimately, a love for coding and analytics and for working with clients led her to join the Cloudbakers team. When she’s not mastering the latest in business technology, Claire fills her time will a vast multitude of interests and activities. These include taking care of her two rabbits, dreaming of a home filled with similar bunnies, reading whatever happened to capture her interest in the bookstore, eating at one of the many fabulous restaurants in Chicago, and generally running around like a madwoman. She’s a perfect fit--after all, we’re all mad here.